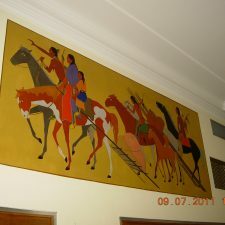 The historic Anadarko post office building houses a massive mural depicting the ceremonial and social life of the Plains American Indians. 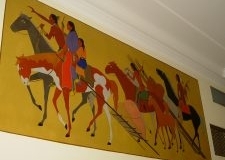 The work consists of 16 variously sized panels of tempera-on-canvas. 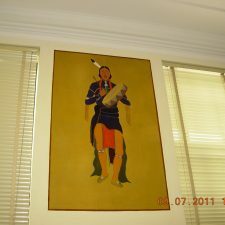 The Anadarko Post Office was previously also the site of the Kiowa Indian Agency of the Bureau of Indian Affairs and is listed on the National Historic Register. 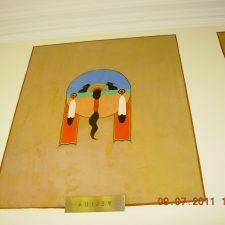 The east side of the building still shows its former name. 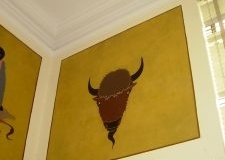 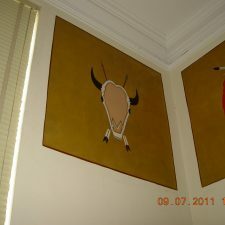 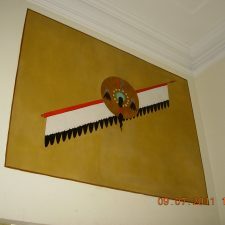 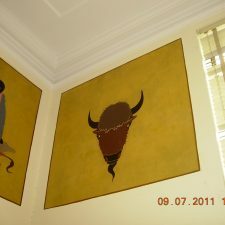 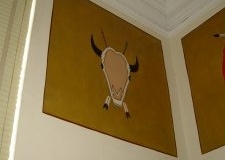 The 16 panels were designed by the late Stephen Mopope, one of the original Kiowa Five artists. 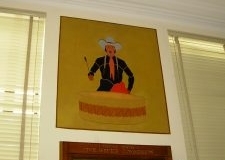 Commissioned by the U.S. Treasury Department in June 1936, this was the largest mural commission ever awarded to a Southern Plains Indian artist. 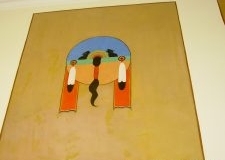 Oscar Jacobson, who was in charge of WPA projects for Oklahoma, commissioned Mopope, assisted by “Kiowa Five” associates James Auchiah and Spencer Asah, to undertake the task of painting 16 murals in the newly constructed post office in Anadarko, Oklahoma. 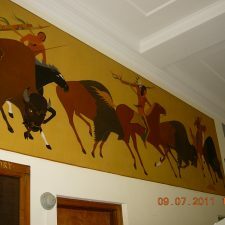 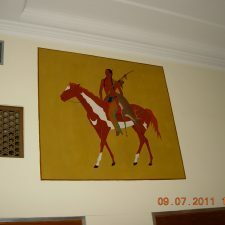 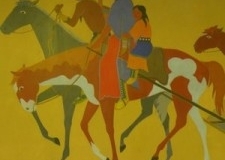 Understanding of the Indian symbolism can greatly increase the appreciation of the murals. 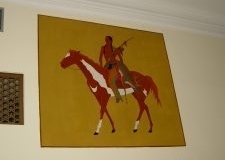 “The Deer Hunter,” pictured above, tells the story of a hunter returning with deer, but only after an extremely long trek, since game is scarce. 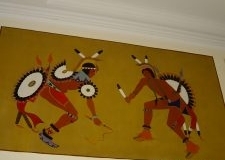 “Two Men in Council” is a painting to help remind us of the Sun Dance. 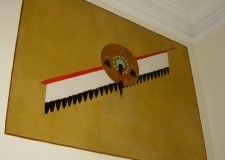 The man holding the ceremonial fan is the chief of the Sun Dance. 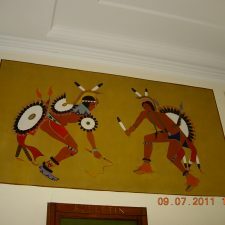 The Sun Dance was traditionally held each summer, before the buffalo hunts to insure a good supply of meat and materials for the winter months. 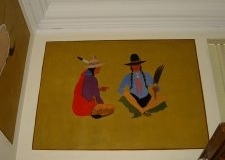 Both men have their braids wrapped, a ceremonial sign, and both wear leggings and hats decorated with a feather. 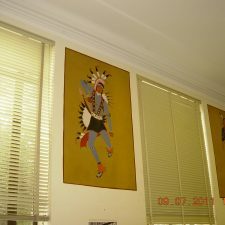 “The Eagle Dancers,” “The Fancy War Dance and Cedar Wood Flute,” “The Scalp Dance,” “Individual War Dance Drummer,” “Eagle Whip and Flute Dancers,” and “Two Women and Child Watching Dancers” symbolize the various occasions where dance ceremonies are performed. 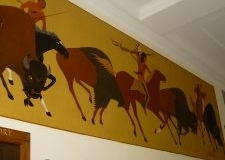 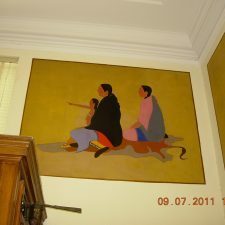 Three large murals depict the Kiowas preparing to move south for the winter. 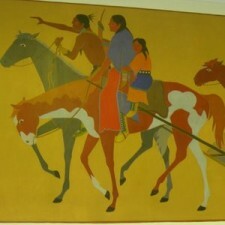 “Kiowas Moving Camp” and “Kiowa Camp Site” show the chores performed by the entire family and the activities during winter life. 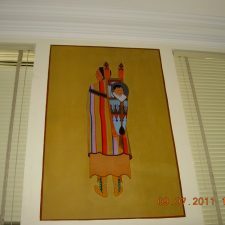 Mopope was also chosen because he was considered by Jacobson to be the best and most outgoing artist of the “Kiowa Five,” a trait which necessary to becoming the lead for the project. 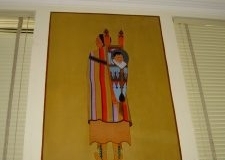 His cultural ties to Anadarko, home to the Kiowa, would provide an accurate depiction of the culture from his personal experiences. 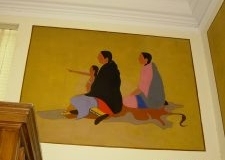 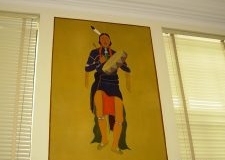 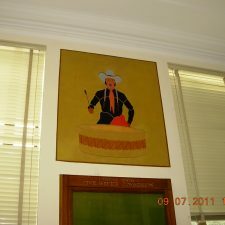 Mopope was also chosen as one of the few Native artists to paint murals in the new Department of Interior building in Washington, DC, home office the Bureau of Indian Affairs, after it was constructed in 1936. 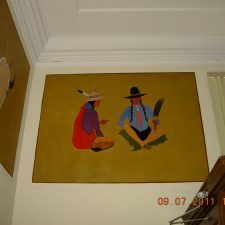 Having come from a line of artists who produced hide and tipi paintings, Mopope had experience in creating large mural-like paintings.